As California, US’ richest state, recently overtook France and Brazil to become the world’s sixth largest economy, according to a Bloomberg analysis, a comparison with India reveals that the American state has 3 per cent of India’s population but 125 per cent of India’s gross domestic product (GDP). California, a powerhouse of innovation and technology, has 39 million people; less than Odisha which has a population of 41 million. Texas follows California with a GDP of $1.58 trillion (Rs 105 lakh crore) - 79% of India’s current GDP with 2.1 per cent of its population. These data offer some perspective as India’s economy - ranked eighth in 2015 with a GDP of $2 trillion (Rs 134 lakh crore) - is projected to climb past Brazil, the United Kingdom, France, Germany and Japan and become the world’s third-largest in 2030 with a GDP of $7.3 trillion (Rs 489 lakh crore), according to an IndiaSpend analysis of 2015 US government data. Over these 15 years, China’s GDP is projected to double to $18.8 trillion (Rs 1,260 lakh crore) - more than twice its current size - helping narrow the gap with the US, whose GDP in 2030 should be $23.8 trillion (Rs 1,595 lakh crore), according to the US projection. The US economy made up a quarter of the global economy in 2006, 23 per cent in 2015, and will be a fifth by 2030. 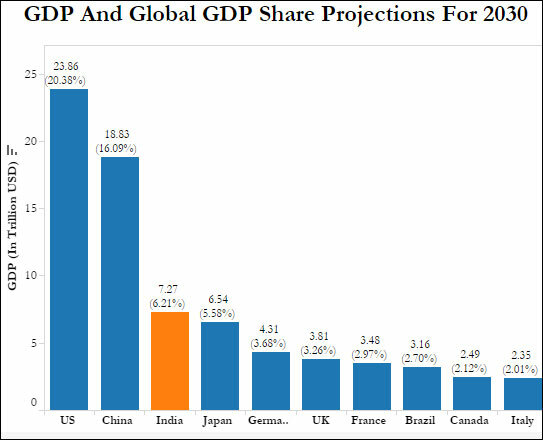 India’s GDP share in the world will almost double from 3.18 per cent in 2015 to 6.21 per cent in 2030. The Indian economy will more than double to $5 trillion in a “matter of few years”, said Finance Minister Arun Jaitley in June 2016, as the government steps on its reforms agenda to accelerate growth. The US projection said India will cross the $5 trillion mark in 2025. 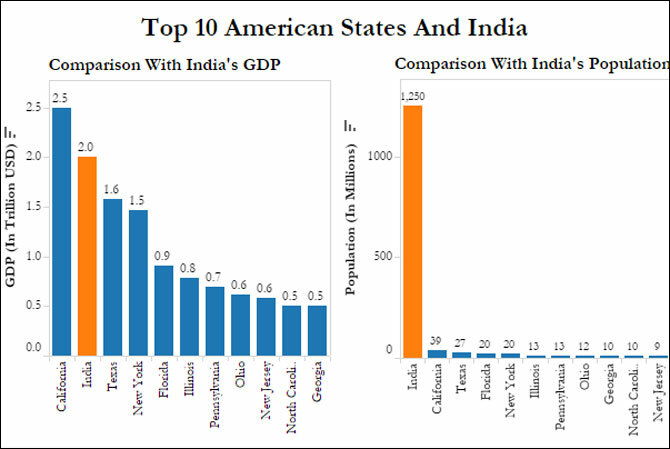 To illustrate the size and power of the US economy, we compared India’s GDP to the GDP of individual US states, factoring in their population, to indicate the magnitude by which India lags the US in wealth and productivity. That lag also indicates the potential for India’s future growth - if that potential is realised. With a GDP of $2.5 trillion (Rs 168,000 crore), California – also the most populous state – created the most jobs of any state in the US in 2015, more than the second- and third-most-populous states, Florida and Texas, combined. Four of the world’s 10 largest companies are based in California. With far fewer people, US states have economies that are not just richer but more productive than those of the Indian states. With a GDP of $0.26 trillion (Rs 18 lakh crore), Maharashtra is India’s richest state, followed by Tamil Nadu ($0.17 trillion, Rs 11.2 lakh crore) and Uttar Pradesh ($0.16 trillion, Rs 10.4 lakh crore). Maharashtra’s GDP almost equals that of Connecticut ($0.26 trillion), ranked 23rd in the US by GDP. Maharashtra’s area is 21 times larger and it has a population 31 times as large as Connecticut. 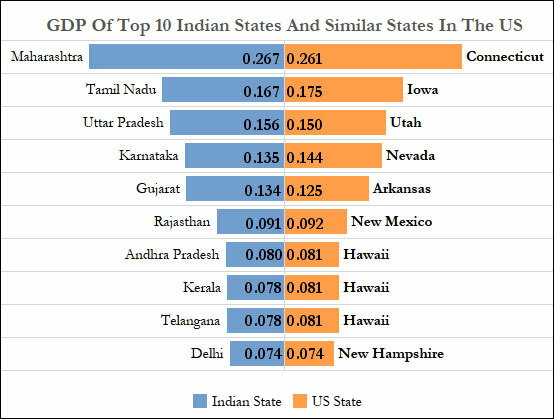 Tamil Nadu, the second richest state, has a GDP almost equal to that of Iowa, the 30th-richest state in the US. The Indian economy is a bright spot in an economically depressed global landscape, and is the world’s fastest-growing economy, said a 2015 report by the International Monetary Fund (IMF). 3. Actual figures of GDPs may vary due to currency fluctuations or change in base years, but the trends largely remain the same. Devanik Saha is a freelance journalist based in New Delhi. 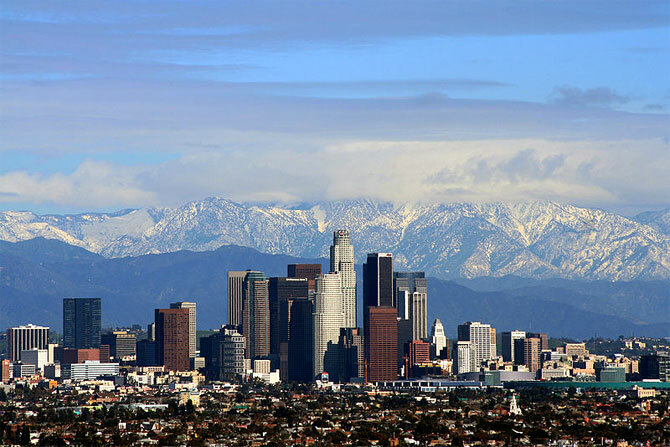 Image; Los Angeles is the second largest city in the United States, after New York City. Photograph: Kind courtesy, Todd Jones/Wikimedia Commons. Has India's anti-trust watchdog lost its drive?